Local (especially European product) is put into a brine and spice solution, sealed in a vat and allowed to naturally marinate for some months while soaking up all the flavors. Modern Big Industry: Meat is thrown onto a conveyor where stainless steel needles inject brine and spices at high-pressure, then mechanical hammers soften up the meat and distribute the marinate. Then they wrap it in plastic and it's on its way to you. Result: The modern Big Industry stuff is far tastier and much cheaper. Small producers don't stand a chance. Why don't the guys who points out how numbers have no meaning ever take apart these anti-locavore posts? Would this not naturally occur as a byproduct of fuel and transportation costs? I understand that forcing local agriculture ignores comparative advantage, but wouldn't this advantage cease to exist if the shipping costs increased enough? As fuel costs, and thus transportation costs, increase, the economies of scale will lose their advantage, and local agriculture seems to be the only solution. Transportation costs are such a small part of the equation, and the comparative advantage so large, that transportation costs would have to approximately quadruple to matter for most goods. To give a somewhat extreme example: Idaho's advantage for producing potatoes is basically 100% compared to the deep south. Idaho's extra transportation costs are just 10% to 15%. The cost of transportation would have to go up seven to ten times to make them equally competitive. I think it is useful to ask the broader question: Is "Local" the best way to go for all production? Should you buy local pottery instead of pottery made in England or Japan (e.g.)? Can't your local tailor sew up clothes as good as Givenchy can? There seems to be one flaw in this argument, and I readily conceed that I may just be reading this wrong, but it seems to me that the argument is that food production will be less efficient because, for example, Alabama is not as inducive to growing potatos as Idaho is. This is only a concern though if the local food movement is intent on providing the same level of diversity in food that we currently enjoy. If, instead, we concentrate on crops that excel in our local environment, then the only real hurdle would be those presented by scale. Is anyone really under the assumption that localized food sourcing means that farmers that have never grown oranges because their region doesn't have the climate for it will start growing that oranges? I find that very hard to believe. My biggest issue with industrial food production is its high reliance on unnatural preservatives and love affair with high fructose corn syrup and other additives that help people get fatter for cheap. No one would have a problem with Cargill, etc. if they operated under ethical means to produce food that isn't genetically enhanced. Industry titans have the power to do it, but they won't, no matter what their ad campaigns tell you. The only way to change this whole system would be to operate under a standard industry-wide code of ethics; not exactly a foreseeable proposition. None of that is really relevant: An ear of corn grown next door has exactly the same preservatives and additives as one grown 2,000 miles away. And yes, there are ignorant people who believe the upper Midwest is a great place to grow strawberries and oranges, and who support locavore movements without realizing that they are effectively supporting a complete absence of fresh produce in their own supermarkets for several months each year (or growing everything in a petroleum-powered hot house at enormous expense to both the consumer and the environment). Complexity, efficiency, robustness (i.e. flexibility/adaptability). Pick your two, because you cannot have all three. In terms of feeding the world's increasing population, I think the key factor is not that people eat local -- it's that people reduce their consumption of (and thus the demand for) industrially raised meat products. A daunting proportion of our corn, soybeans, and other crops are used to feed animals instead of people. A 1997 study out of Cornell indicates that "if all the grain currently fed to livestock in the United States were consumed directly by people, the number of people who could be fed would be nearly 800 million" (http://www.news.cornell.edu/releases/aug97/livestock.hrs.html). The benefits of a reduced emphasis on meat production/consumption would be manifold; not only would producing less meat free up grain and help alleviate hunger, the health of the public would also benefit from reduced meat consumption. You use Corn and Soybeans as the crops (and potatoes) for making assumptions about the local food movement. That does not make sense as those are a large scale crops. What about looking all the other fruits and veggies that are grown? Lettuce, berries, apples, carrots etc. Buying local with those make sense in regards to health, fuel consumption, etc. Sure, to get my local corn syrup supply from the farmer down the road I would need more cropland. But what about the everyday fruits, veggies, and meat we eat? It is very cheap to truck or boat food from around the world. It will always be cheaper. But basing an anti-local movement based on corn and soybeans makes no sense to me. Most of the foods you eat are those large-scale crops. The bulk of the typical human diet is grains, not fruit. Look at the plant foods on your breakfast plate: toast, bagels, muffins, and cereal are grains. The contribution of berries, if any, is present only in that thin veneer of jam. Well, it sounds like you can enjoy you efficient, cheap, tasteless monocultured grains and straches and I can enjoy my inefficient, expensive, delicious locally grown and harvested meats and produce. You can also enjoy being dependent on an exploitative agribusiness and all the global infrastructure it relies upon and the nasty side effects of a diet high in starches and grains, while I enjoy getting my food from my rural neighbors and all the wonderful side effects of a diet high in nutrition and flavor. Yes, local food production is less efficient than a centralized system. That's good, because the opposite of efficiency is resilency and robustness. You seem to be relying on a key assumption yourselves: that what can be produced in California or Idaho must also be produced in Alabama. This is not, to my knowledge, a part of the eat local movement. Rather it would prefer eaters to enjoy the foods local to their region, a big change. But what that means, as described in the dilemma, is that you can't/shouldn't get apples outside the north east, as it is a local NE crop. The other argument, is that there are certain externalities of the current food system, such as pollution, soil erosion, fattier meats, and fossil fuel consumption, that rather than internalized through taxation, are actually subsidized. The argument is made then, small, poly-crop farms, such as polyface, are more efficient in that they limit some of these externalities. There is, however a compelling case to be made that the efficiencies of polyface, cannot be translated into a system to feed 7 billion. Or that consumers will not sacrifice the variety afforded to them by the modern system. Not to mention that, modern manufacturing of food itself is energy rich, you are transporting not only the killed cows but you are transporting the corn you feed them using combustion engines to do the work that on an organic farm a grass fed cow does her self by just walking around and munching on grass... the current mass manufacture methods are of food are completely unsustainable from that energy perspective. That is before you go into the health issues and drugs required to keep the cows alive in the modern manufacturing process versus the lot stronger grass fed cow with its own healthy immune system. Interesting. I think this must be directed at some audience that the author believes wants to fully replace modern agro business. I see small/local/urban agriculture as enhancing the current system. Consider. What are we really talking about if not creating or repurposing greenspaces? To me that suggests there are a host of positive externalities that the author didn't consider. Urban heat island reduction, the clean up of brownfields and wasted or disused urban spaces, the opportunity use gardens as a lab to teach science and social design and the health benefits of community gardening as an activity spring to mind. Moreover, many if not most, local farmers who favor this sort of growing promote organic methods. Simply subtracting the benefit of industrial scale to make claims about fertilizer/chemical requirements is specious as it doesn't take into account farming methods that obviate the need for those products. I would also add that the author uses industrial ag's formulation that maximum calorie production equals ending hunger. But as is become clear with the plauge of first world obesity, calories might fill stomachs but that doesn't mean the food produced is nutritious or healthy. A fair assessment would take into account the long term health costs of a highly processed diet. Obviously, we are going to need industrial agro business for many years to come but there should be space for experimenting with alternatives and assessments of relative value of those alternatives needs greater scope. 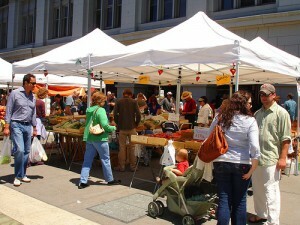 Like many of the writers, I enjoy going to farmers' markets and buying locally grown food. Unlike many writers, I do not have the ego to force my preferences on millions of people who live in cities or who cannot afford to do this. Go into stores in New York City and try to imagine how many "local farms" would need to exist to provide fruits and vegetables to 8 million people. There would quickly be food riots and starvation due to the lack of food--because you won't allow mass produced or non-local food (no Idaho potatos!). There are farmers' markets in NYC and they are well received. But they serve a tiny % of the population. Making it harder to feed people is not a good policy. As others have said, the goal isn't to duplicate agri-business on a local scale. We don't really want to grow our own soybeans. However, planting gardens in our backyards can give us fresh vegetables. Much of the mass produced crops in the US go to feeding animals or for energy. If we changed our diets, ate less meat, and maybe had some egg laying chickens in our backyards, we could grow highly nutritious foods efficiently and locally. There are some very interesting urban garden experiments where warehouses are being turned into profitable vegetable gardens that sell to local businesses and consumers. The current business model for agriculture could be replaced by new business models that create growing environments in places never before used. We have focused on land for crop growing because we used to have lots of it. But if we focus on how to turn more underutilized space in cities and suburbs into growing machines, a lot more creative solutions will likely open up.